Researchers have captured information stored inside tiny magnetic regions in meteorite samples using a detailed imaging technique at the BESSY II synchrotron in Berlin. Meteorites are fragments of asteroids formed in the early solar system. The asteroids were heated up by radioactive decay, causing them to melt and segregate into a liquid metal core surrounded by a solid rocky mantle. The convection of the liquid metal generates a magnetic field similar to how the Earth's magnetic field is created. The information found by the team relays the magnetic field of the meteorite during core solidification on its parent body. These magnetic field readings provides a brief glimpse on the Earth's own magnetic field as the Earth's core continues to freeze. The meteorites used are called Pallasite Meteorites which are made up of iron and nickel. 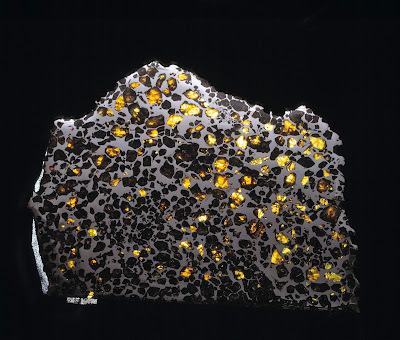 The body of pallasite meteorites are studded with silicate crystals that resemble gems. The team found that along with iron and nickel, there are also tiny nanosized minerals called tetrataenite. These tetrataenites are just around 100 nanometers long which is magnetically much more stable than the rest of the meteorite, and holds within it a magnetic memory that the researchers have gathered. The data shows that the magnetic fields generated by the asteroids lasted longer than expected; about several hundred million years after the it formed. The results help to answer many of the questions surrounding the longevity and stability of magnetic activity on small bodies, such as asteroids and moons. Scientists now think that the Earth's core only began to freeze relatively recently in geological terms, maybe less than a billion years ago. How this freezing has affected the Earth's magnetic field is not known. "In our meteorites we've been able to capture both the beginning and the end of core freezing, which will help us understand how these processes affected the Earth in the past and provide a possible glimpse of what might happen in the future," said Dr Richard Harrison of Cambridge's Department of Earth Sciences, who led the research. The dying moments of an asteroid's magnetic field have been successfully captured by researchers, in a study that offers a tantalising glimpse of what may happen to the Earth's magnetic core billions of years from now. Using a detailed imaging technique, the research team were able to read the magnetic memory contained in ancient meteorites, formed in the early solar system over 4.5 billion years ago. The readings taken from these tiny 'space magnets' may give a sneak preview of the fate of the Earth's magnetic core as it continues to freeze. The findings are published today (22 January) in the journal Nature. Using an intense beam of x-rays to image the nanoscale magnetisation of the meteoritic metal, researchers led by the University of Cambridge were able to capture the precise moment when the core of the meteorite's parent asteroid froze, killing its magnetic field. These 'nano-paleomagnetic' measurements, the highest-resolution paleomagnetic measurements ever made, were performed at the BESSY II synchrotron in Berlin. The researchers found that the magnetic fields generated by asteroids were much longer-lived than previously thought, lasting for as long as several hundred million years after the asteroid formed, and were created by a similar mechanism to the one that generates the Earth's own magnetic field. The results help to answer many of the questions surrounding the longevity and stability of magnetic activity on small bodies, such as asteroids and moons. "Observing magnetic fields is one of the few ways we can peek inside a planet," said Dr Richard Harrison of Cambridge's Department of Earth Sciences, who led the research. "It's long been assumed that metal-rich meteorites have poor magnetic memories, since they are primarily composed of iron, which has a terrible memory - you wouldn't ever make a hard drive out of iron, for instance. It was thought that the magnetic signals carried by metal-rich meteorites would have been written and rewritten many times during their lifetime, so no-one has ever bothered to study their magnetic properties in any detail." The particular meteorites used for this study are known as pallasites, which are primarily composed of iron and nickel, studded with gem-quality silicate crystals. Contained within these unassuming chunks of iron however, are tiny particles just 100 nanometres across - about one thousandth the width of a human hair - of a unique magnetic mineral called tetrataenite, which is magnetically much more stable than the rest of the meteorite, and holds within it a magnetic memory going back billions of years. "We're taking ancient magnetic field measurements in nanoscale materials to the highest ever resolution in order to piece together the magnetic history of asteroids - it's like a cosmic archaeological mission," said PhD student James Bryson, the paper's lead author. The researchers' magnetic measurements, supported by computer simulations, demonstrate that the magnetic fields of these asteroids were created by compositional, rather than thermal, convection - meaning that the field was long-lasting, intense and widespread. The results change our perspective on the way magnetic fields were generated during the early life of the solar system. "It's funny that we study other bodies in order to learn more about the Earth," said Bryson. "Since asteroids are much smaller than the Earth, they cooled much more quickly, so these processes occur on shorter timescales, enabling us to study the whole process of core solidification." Scientists now think that the Earth's core only began to freeze relatively recently in geological terms, maybe less than a billion years ago. How this freezing has affected the Earth's magnetic field is not known. "In our meteorites we've been able to capture both the beginning and the end of core freezing, which will help us understand how these processes affected the Earth in the past and provide a possible glimpse of what might happen in the future," said Harrison. However, the Earth's core is freezing rather slowly. The solid inner core is getting bigger, and eventually the liquid outer core will disappear, killing the Earth's magnetic field, which protects us from the Sun's radiation. "There's no need to panic just yet, however," said Harrison. "The core won't completely freeze for billions of years, and chances are, the Sun will get us first." What Is It Like At The Earth's Core? Credit: Image Copyright Natural History Museum, London. Sample used from the Natural History Museum Meteorite Collection.